The rules of the road treat bicycles like vehicles, but poor vehicle driving attitudes and behaviours put cyclists at significant risk when sharing the road with vehicles. The driving attitude that causes the most collisions is a simple failure on the motorist’s part to pay attention to the important task at hand, which is piloting thousands of pounds of steel on a road shared with other motorists, cyclists and pedestrians. 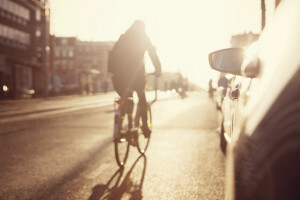 Cyclists are typically hyper-vigilant about what is going on around them, but vehicle drivers regularly drive as if they are on some form of vehicle autopilot. The most common vehicle-bicycle collision we see is when a vehicle and bicycle are travelling the same direction along a road and the vehicle driver, failing to notice the cyclist, makes a right turn directly into, or across the path of, the cyclist. Another common collision arising from a failure to pay attention is a motorist opening a vehicle door, again directly into the path of a cyclist. Then there are the aggressive motorists who have some chip on their shoulder about having to share the road, failing to leave sufficient space between the vehicle and a bicycle and other aggressive driving behaviours. Our firm’s former receptionist, who had been an organizer of “Bike to Work Week”, suffered a brain injury when a motorist came up tight behind her and the occupants of the vehicle yelled at her, leading her to take evasive action of swerving her road bike off the raised pavement roadway and onto the soft shoulder, causing her to lose control. Impaired drivers throw even more uncertainty and danger into the cyclist’s world. As much as we have worked, as a society, to eliminate impaired driving, we are a long distance away from succeeding. Often vehicle-bicycle collisions result in little or no damage to the vehicle. Some motorists take that as an opening to try to escape responsibility for their driving behavior, and flee the scene. Any victim of a hit-run collision should seek legal advice as immediately as possible to ensure necessary steps are taken to qualify for British Columbia’s “unidentified motorist” claim protection provided by ICBC. insured motorist they are defending, even if liability seems very clear. Even if ICBC initially accepts responsibility on behalf of their insured motorist, liability can be raised and challenged down the road. In every case, we take all necessary steps to investigate and preserve evidence so as to be armed to prove liability if it becomes necessary to do so, regardless of what liability position ICBC takes initially. or call toll free 1.855.HERGOTT / 1.855.437.4688 (ext. 0).